In their recent BERA Blog article (10 August), Komatsu and Rappleye raise the idea that the high achievement of Asian education systems – and specifically Japan’s educational achievements – have been ignored because of cultural bias and a stereotype of ‘exam hell’. I would like to argue here that if they have been dismissed, it is actually because of an increased understanding of Asian education in recent years (see for example Park 2013), and a recognition of the similar problems faced by teachers globally. There is a lot to be learned from Japan, but there is also a danger that, in an attempt to avoid cultural bias, we learn only a small part of the whole picture. For example, Brinton (1988; 2010) has written extensively on how Japan’s education system plays a pivotal role in the problems faced by many young Japanese, and how Japanese scholars are seemingly unaware of such problems (Brinton 2010: xiii). The poor opportunities available to young Japanese men leaving the education system are an obvious contributory factor to Japan’s declining birth rate (Brinton 2010: 30–31). Like the British education system, among others, the Japanese education system fails a much larger number of young people than many would care to admit. Such effects are not measured by PISA, and we need to be critical of judging any education system. Komatsu and Rappleye do recognise that PISA is flawed, and argue – rightly, in my opinion – that Asian education should become part of a global onto-epistemic resource (see also Tan and Chua 2015), a resource to help us better understand how we know reality. However, despite seeming to adopt Takayama’s (2008; 2018) justified criticisms of PISA, Komatsu and Rappleye fail to question the actual onto-epistemic basis of PISA itself, and instead their published research uses PISA data to attack the validity of student-centred learning (Komatsu and Rappleye 2017), creating an unrealistic dichotomy between teacher-centred learning and student-centred learning that is far from the messy reality of teaching in Japan or elsewhere. In doing so they are in danger of justifying exactly the pedagogy that failed the Japanese students that Brinton studied in the 1990s and onwards, and of justifying a narrow type of pedagogy that has been highly criticised elsewhere (see for example Thomson and Hall 2018; Ward and Quennerstedt 2018). Japan’s teachers often take PISA scores as a serious evaluation of their own teaching, but their reaction is often actually to focus on a narrow repertoire (Cave 2007; 2016). Initial data from my ongoing PhD research suggests that overreliance on teacher-centred lessons – what Komatsu and Rappleye term ‘Type II learning’ (2017) – is more a result of survival teaching (Woods 2012) and reduces the relevance of Japanese teachers, with many students seeing extracurricular activities and part-time work as better places of learning. Dominic Edsall is currently a doctoral candidate in the Curriculum, Pedagogy and Assessment department at the UCL Institute of Education. 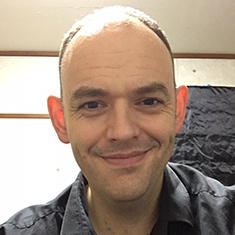 He has nearly 20 years’ experience teaching science and English in the UK and Japan, and he has taught at a variety of schools and universities. His doctoral research focuses on teacher negotiation of language learner autonomy at universities in Japan.